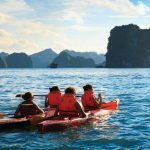 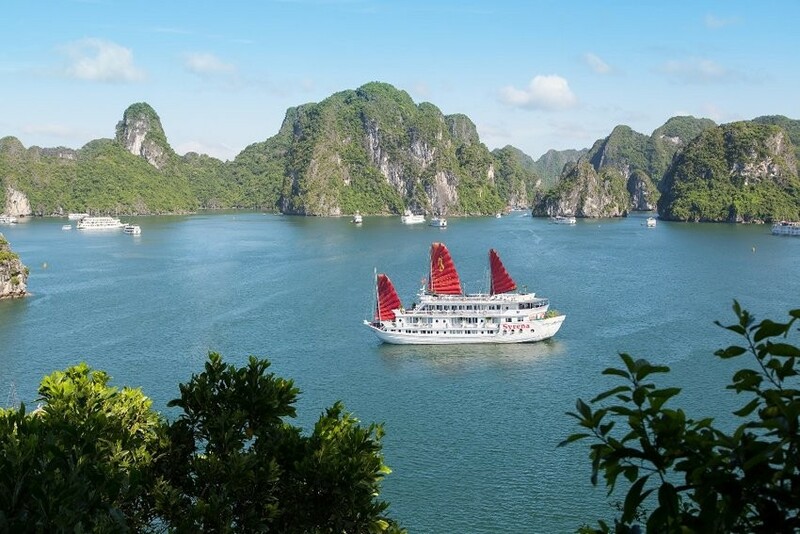 Top 3 best luxury cruises in Halong Bay, Vietnam - Living + Nomads – Travel tips, Guides, News & Information! 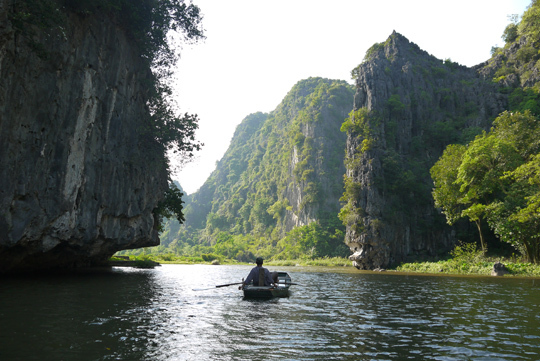 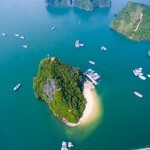 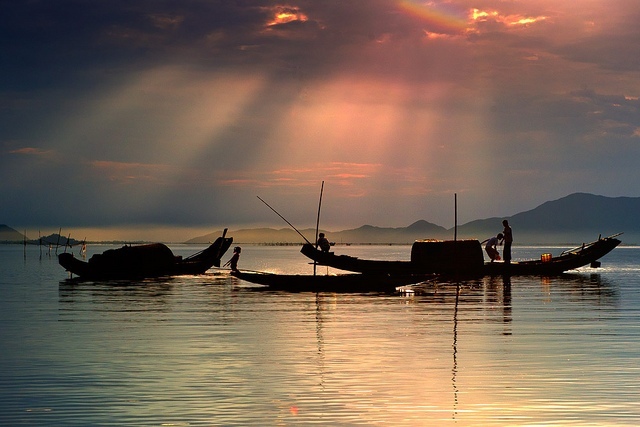 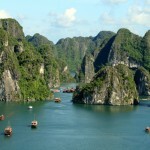 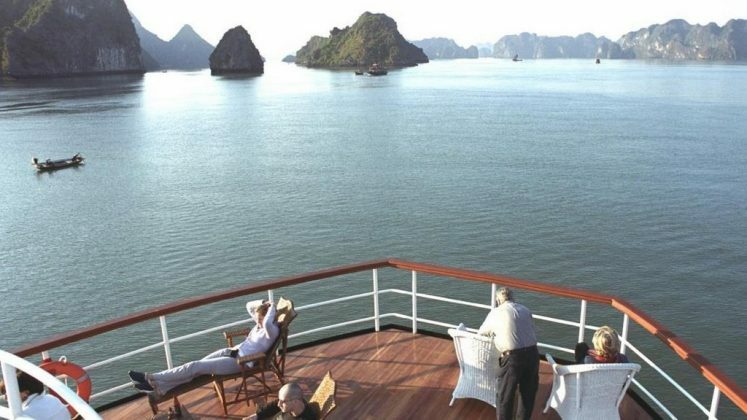 Halong Bay, Vietnam – the descending dragon bay – is renowned for its infinite grandeur and serenity all over the world. 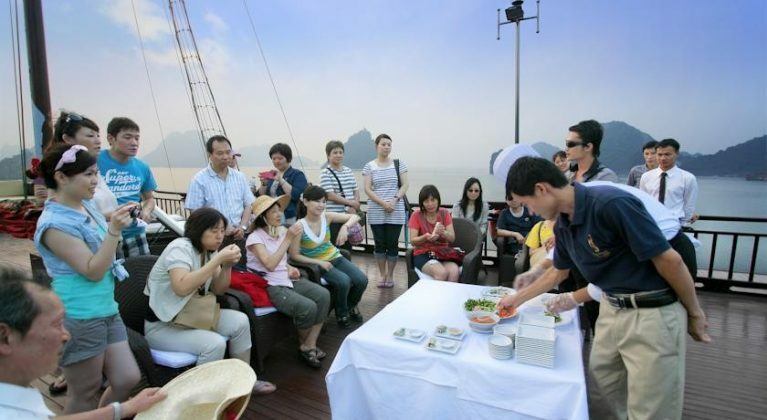 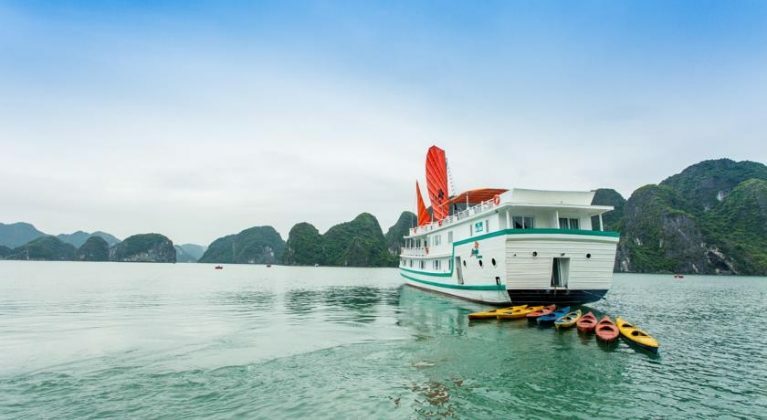 And to visitors, cruise tours probably make an important feature of this UNESCO World Heritage Site – especially overnight cruise is highly recommended as one of the top can’t-be-missed activities on your Halong travel. 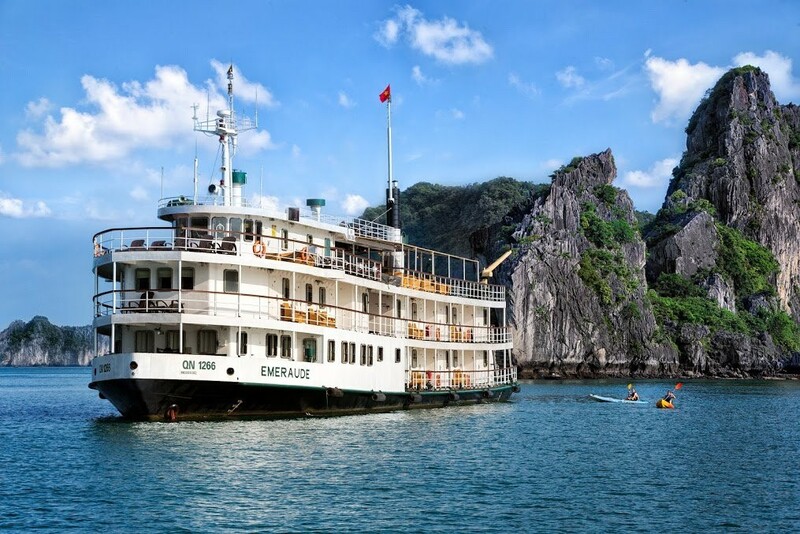 Emeraude, a magnificent ship, is modeled in the tradition of the grand old single-wheeled paddle steamers of the colonial era. 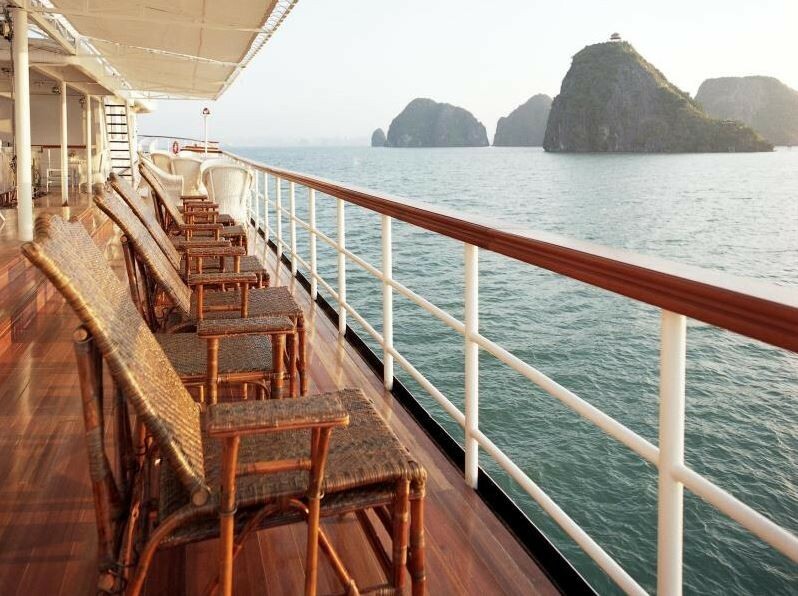 When you step onto the Emeraude, it feels like time traveling, back to the past. 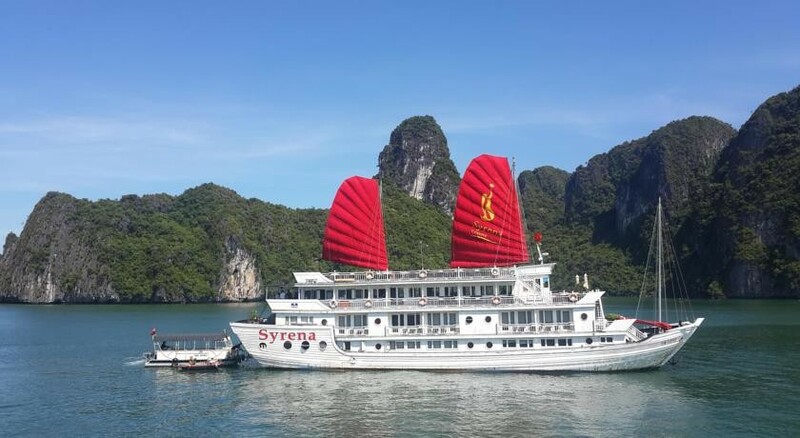 And the vessel’s history is as captivating as a fine old yarn. 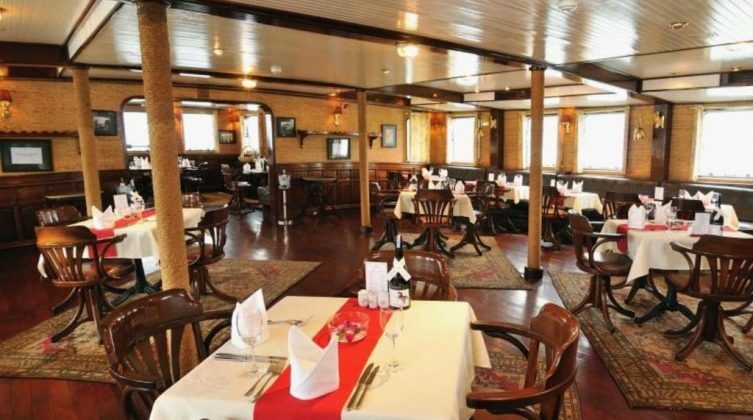 The vintage style boat is a unique one decorated in a French colonial style with glossy dark wood and antique features. 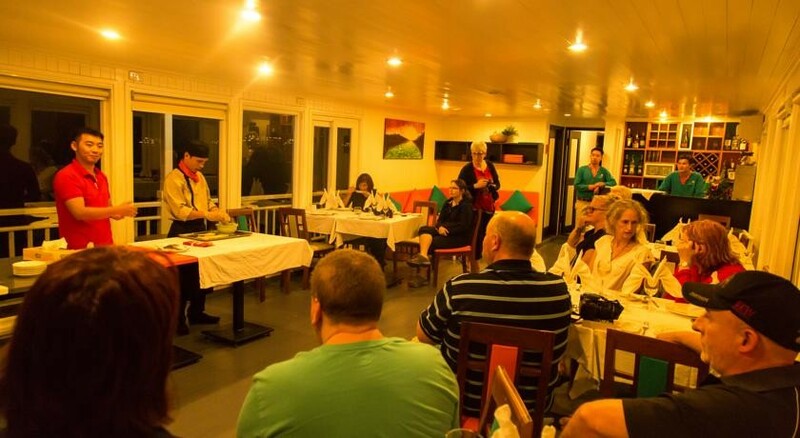 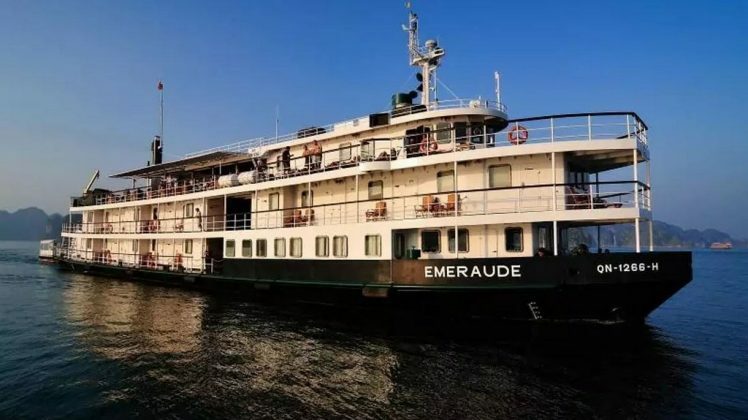 In 2003 the Emeraude started operating, offering overnight excursions to the UNESCO World Heritage site with entertainment and gourmet food onboard. 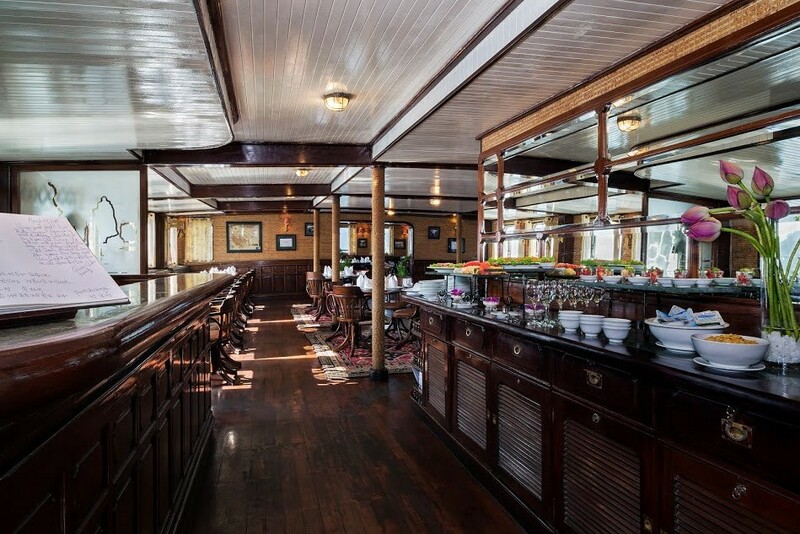 The classic cruiser is a replica of a 1920s French paddle steamer that sailed around the famous bay nearly 100 years ago. 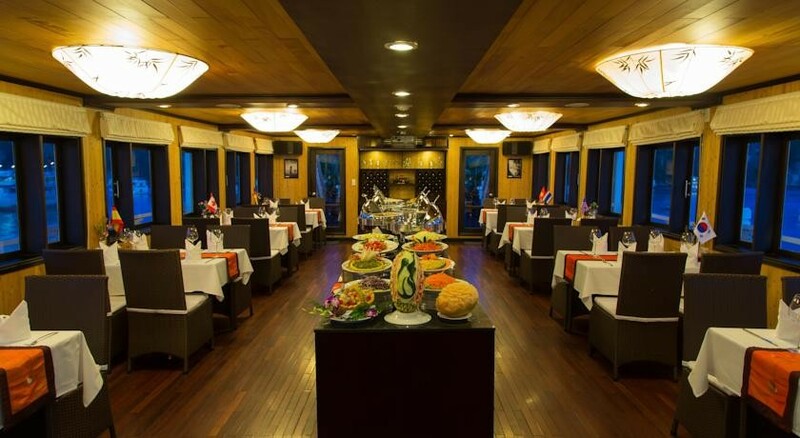 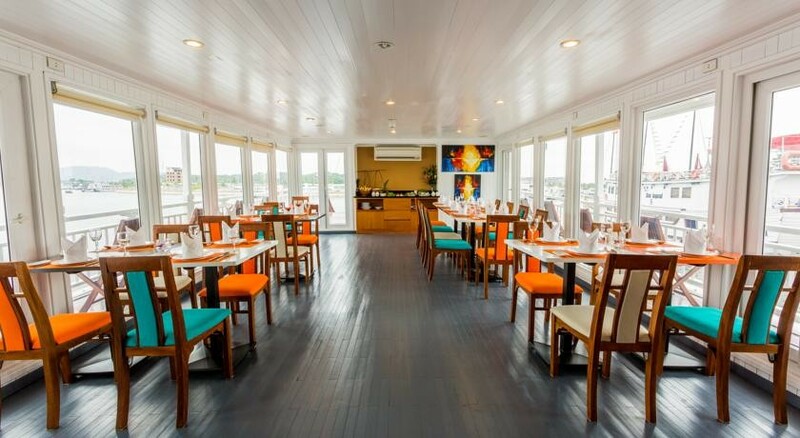 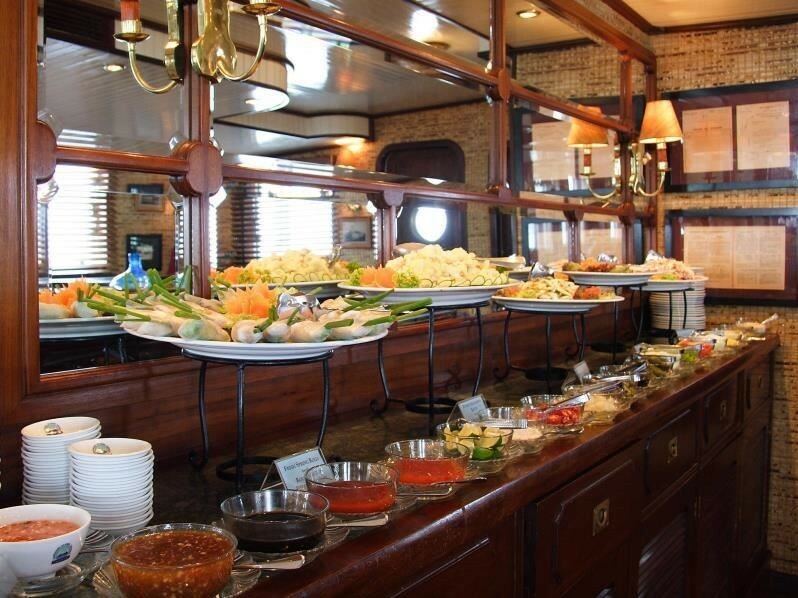 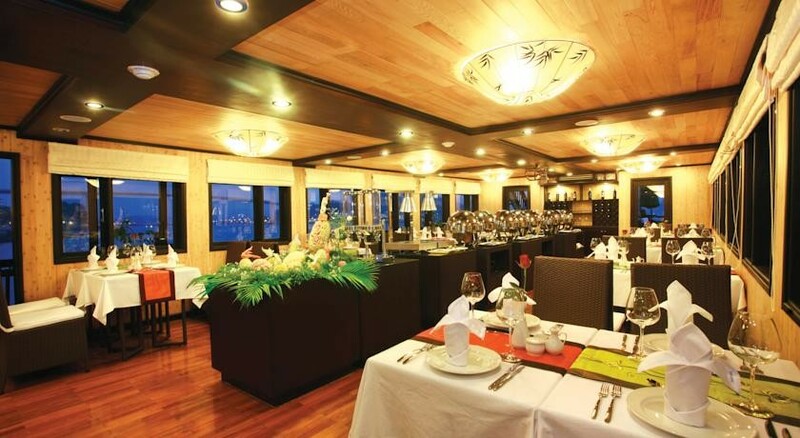 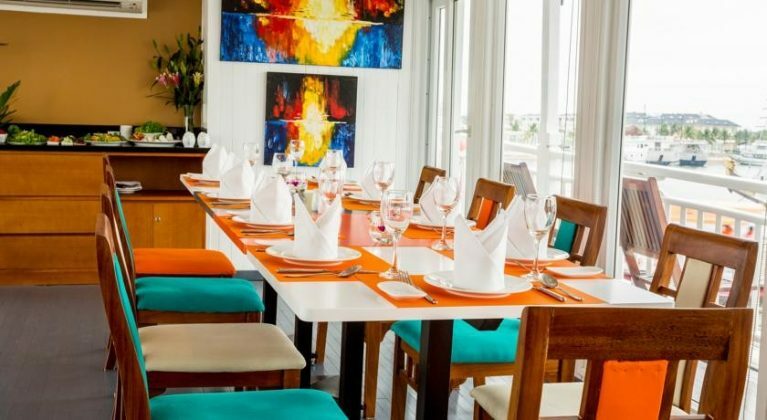 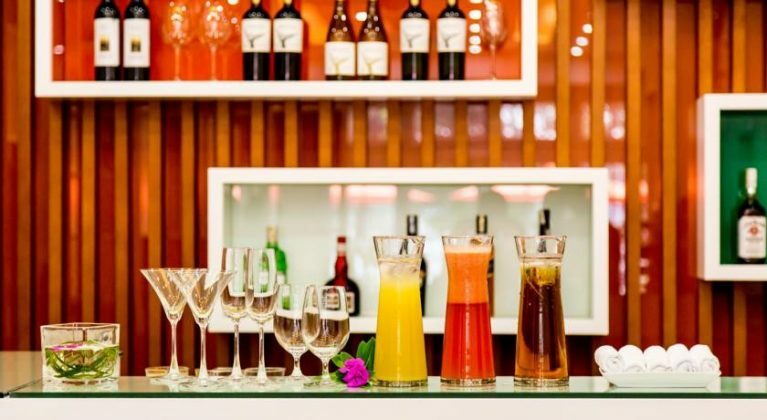 Emeraude has been rebuilt in Hai Phong with its length of 55 m, consisting of 3 floors with 37 cabins, 3 special cabins, 2 bars, and 1 restaurant. 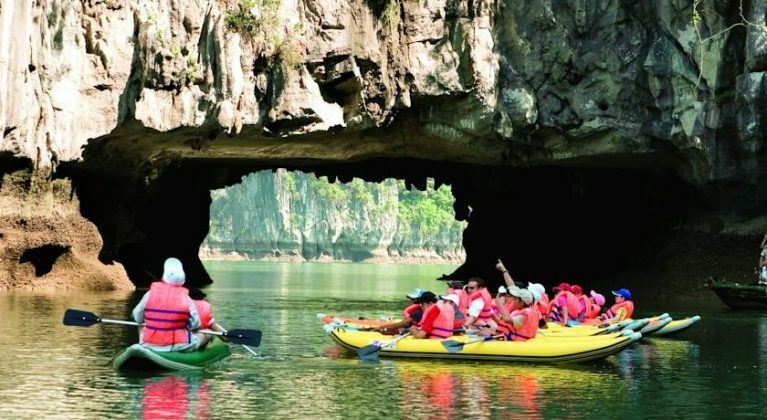 Emeraude not only offers you an itinerary of exploring the splendid seascapes strewn with hundreds of islets, on the calmest waters of Halong Bay, but also please you with many exciting activities such as kayaking, squid fishing at night, exploring unbelievably mind-boggling caves, visiting floating fishing villages, participating in early morning Tai Chi classes, learning how to make Vietnamese spring rolls, watching “Indochina” movie on the Sun Deck, etc. 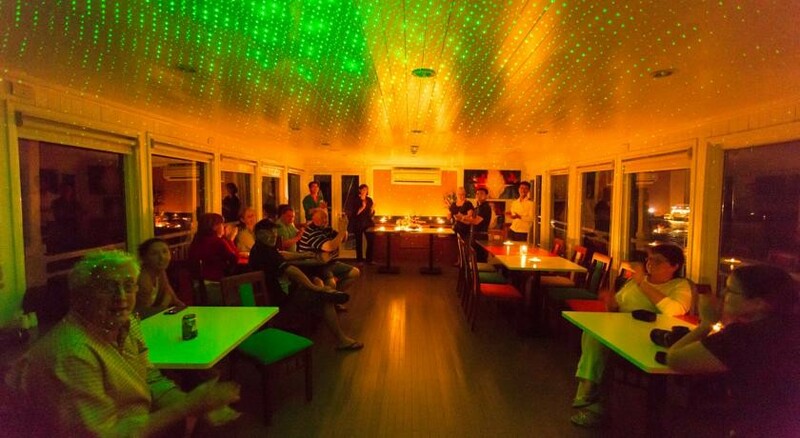 All will surely make your trip much more enjoyable and give you kind of will-never-forget cruise experience. 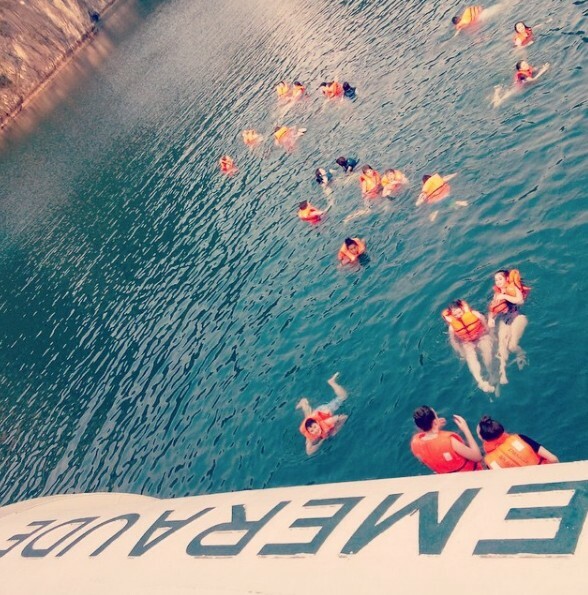 Additionally, spacious, private, and relaxing theme of the journey is the best thing Emeraude aims to give tourists. 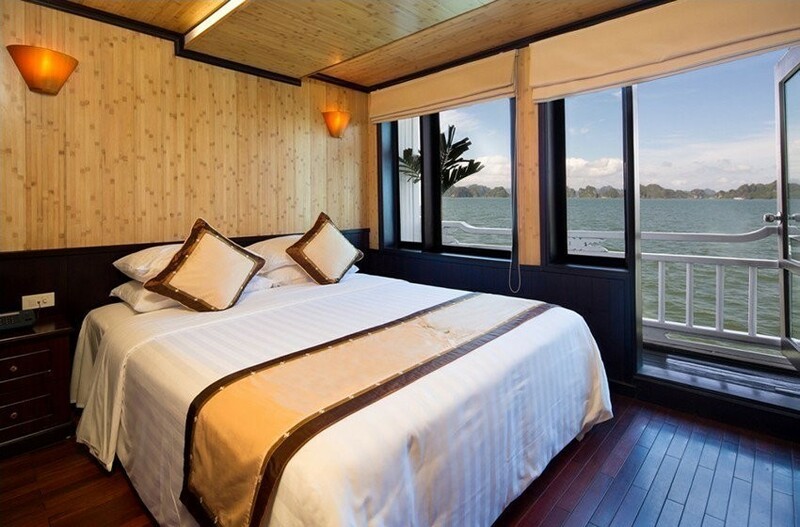 So the main floor and upper deck have many soft chairs where you can restfully lie down watching the sea. 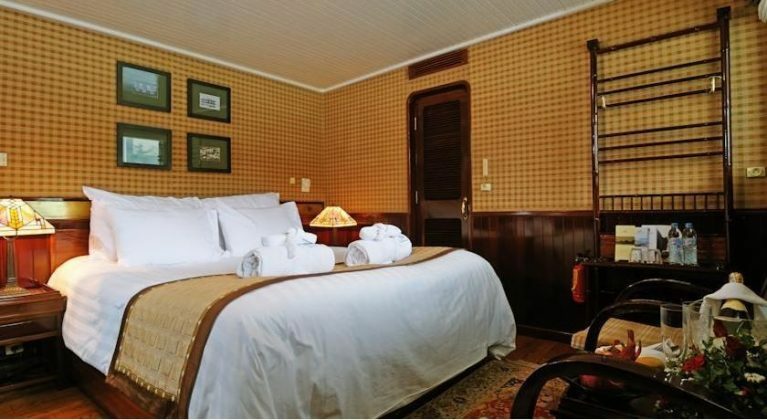 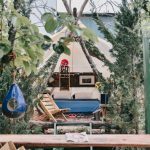 Inside the rooms are old-fashioned and grand, with big comfortable beds and green-tiled bathrooms with showers and all necessary amenities. 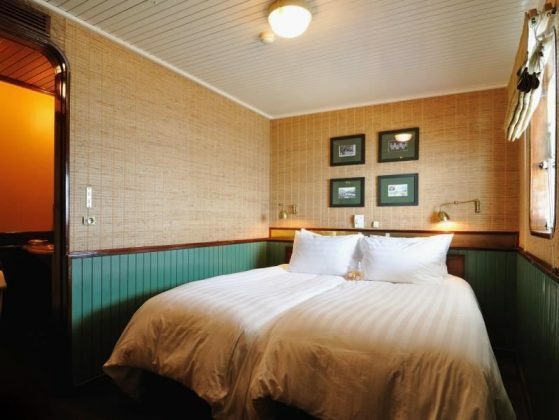 There are also plenty of windows letting in natural light and showcasing the beautiful scenery. 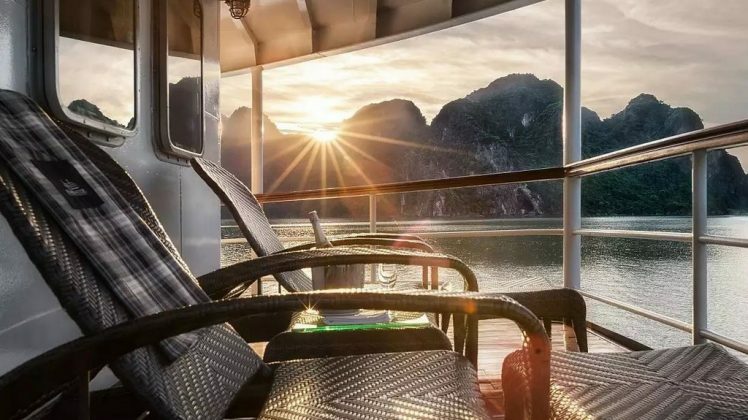 You can check rates & availability for this cruise on Agoda.com or Booking.com. 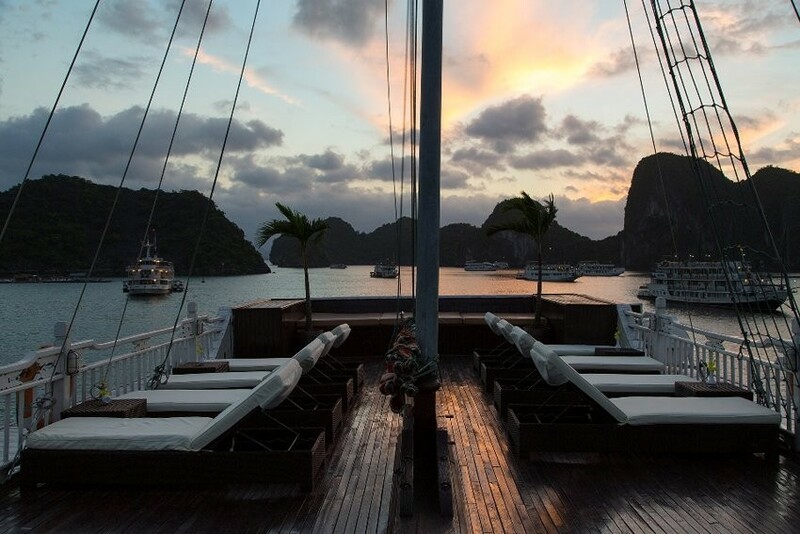 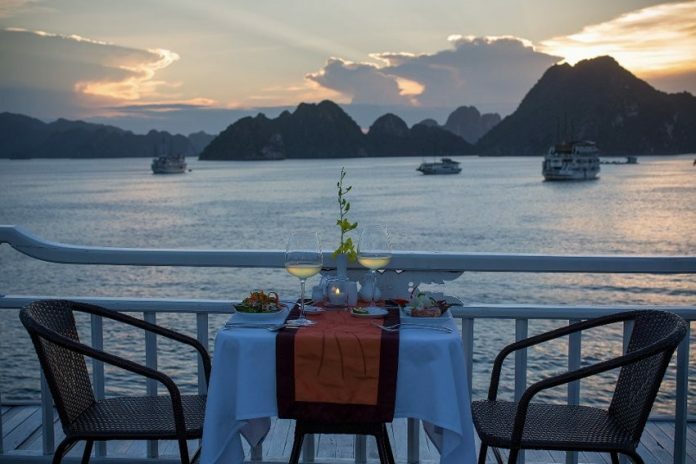 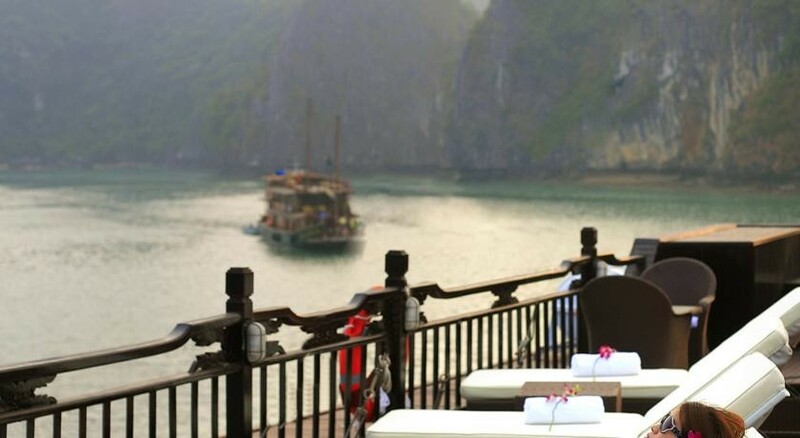 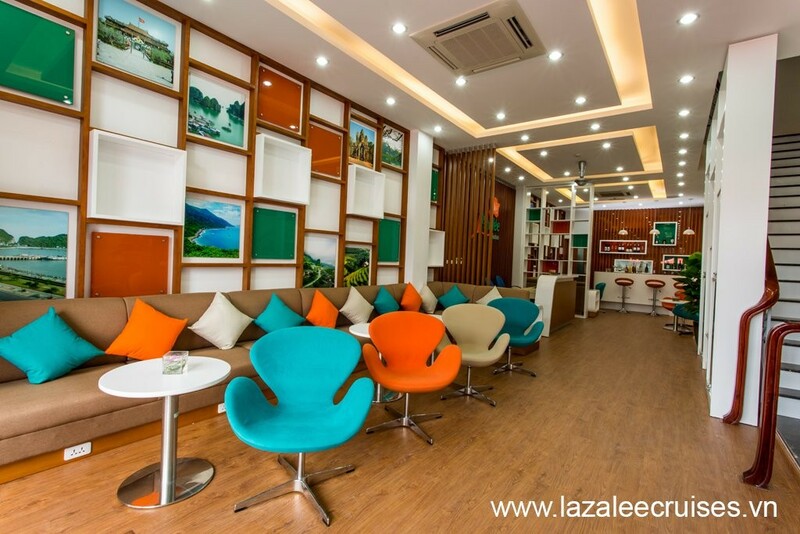 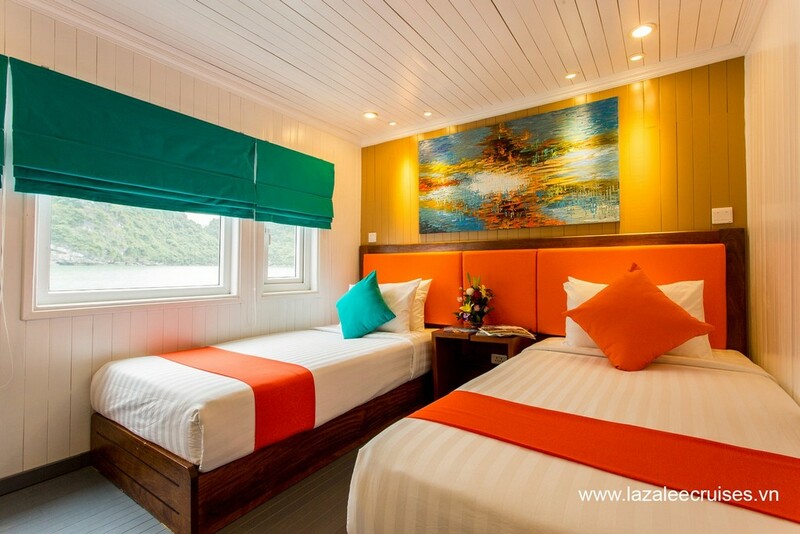 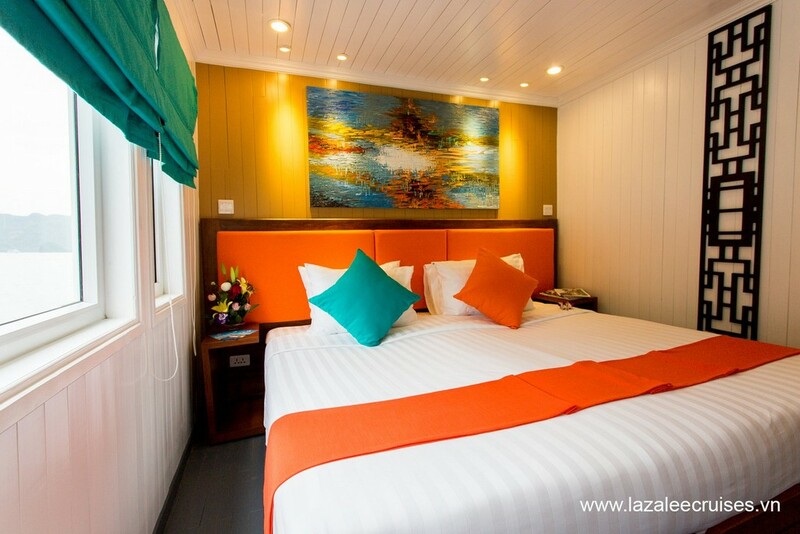 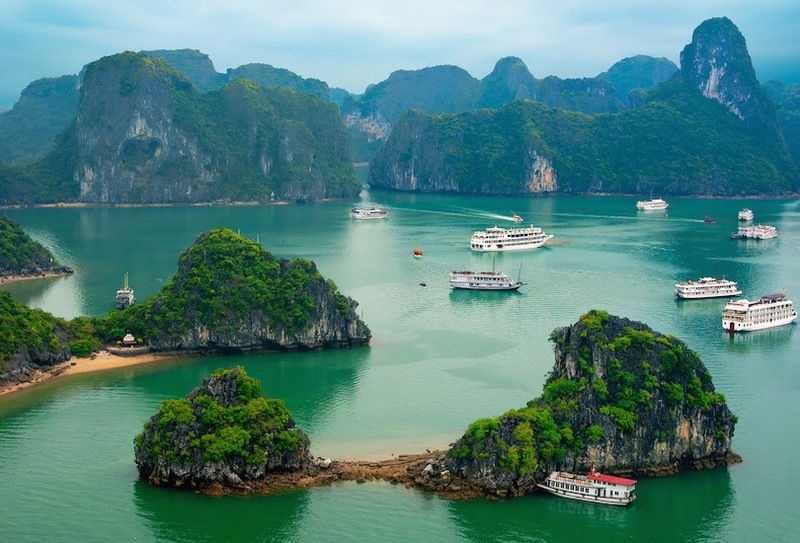 L’Azalee Cruise, launched in 2015, is Ha Long Bay’s newest premier cruise experience. 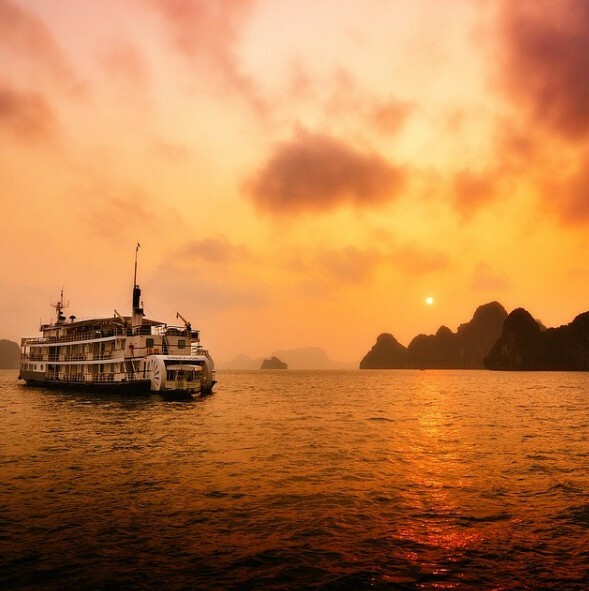 While enjoying the relaxing moments on this luxurious cruise, you can explore the amazing natural wonder of Ha Long Bay on a day cruise or overnight cruise or private cruise through the jade green waters of this UNESCO World Heritage site. 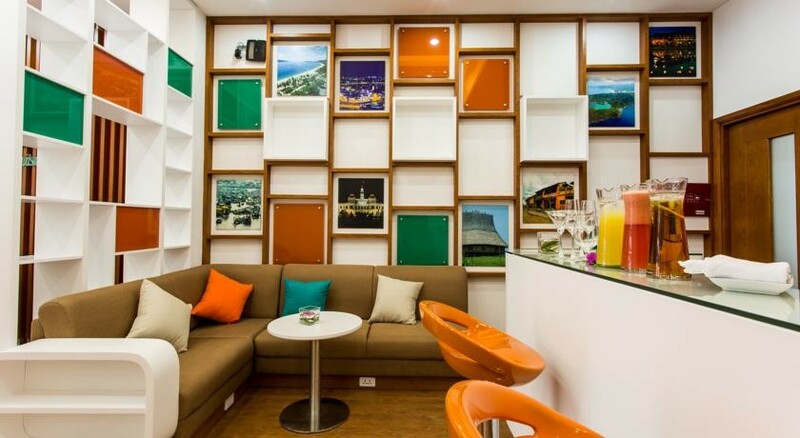 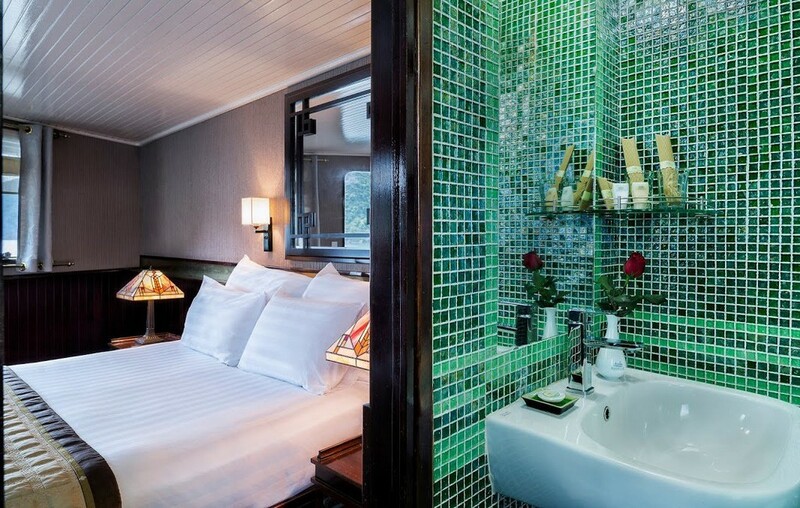 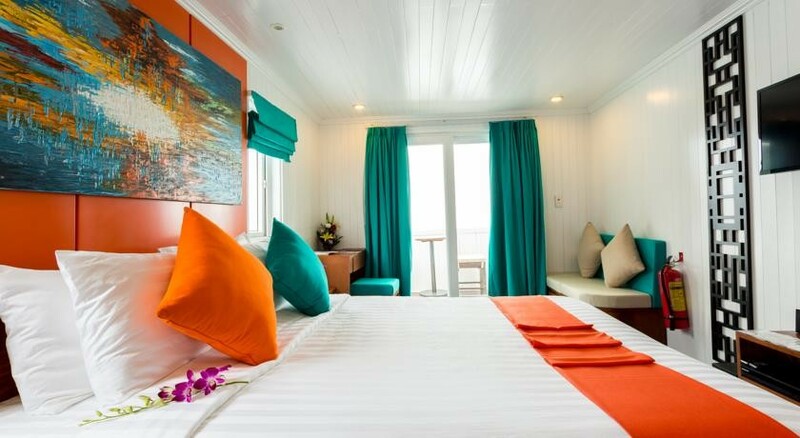 Rooms on the cruises’ cabin are relaxing with soothing colors, bringing about a kind of relaxing and comfortable feeling. The interior’s decoration is literally simple but equally luxurious. 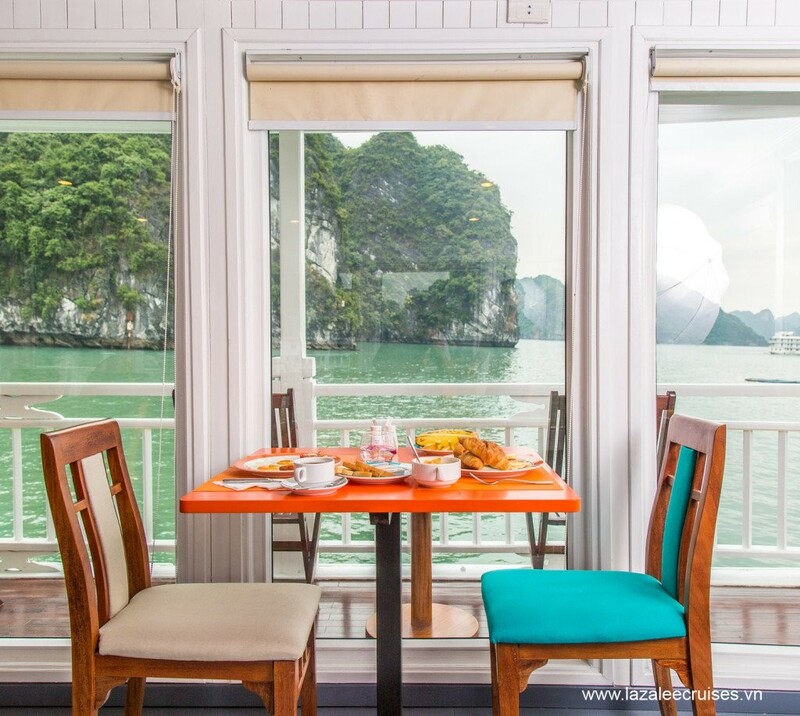 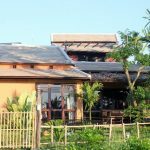 It would be a great start of your holiday when relaxing on the deck and watching the islands and cliffs going by, with music softly playing in the background. With 6 boats designed and operated to meet all international standards. 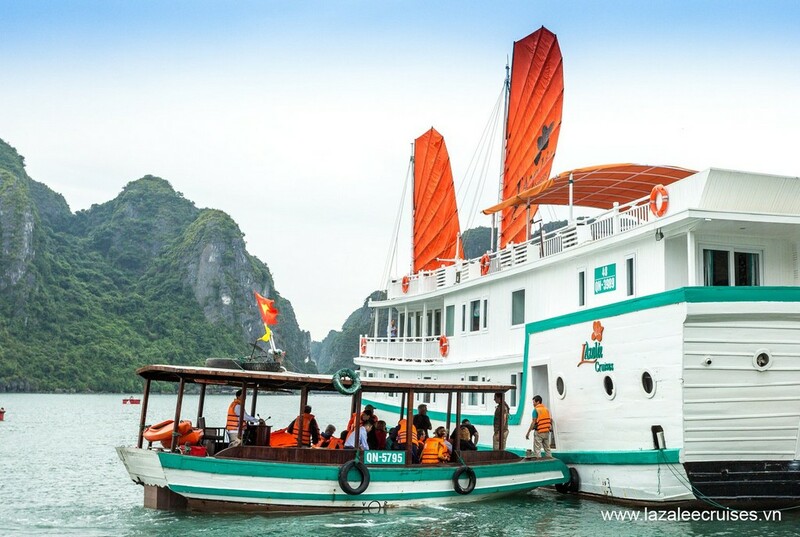 L’Azalée Cruises provide a wide range of services including L’Azalée Premium, Deluxe and Classic Cruises to explore stunning Halong Bay. 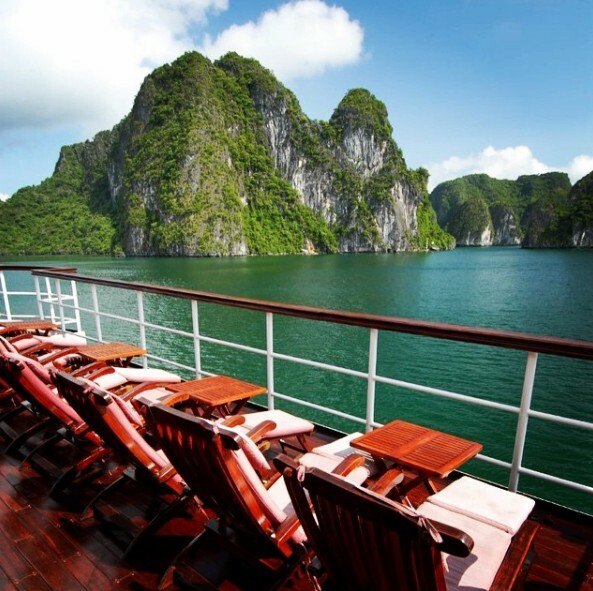 You can check rates & availability for this cruise on Booking.com or Agoda.com. 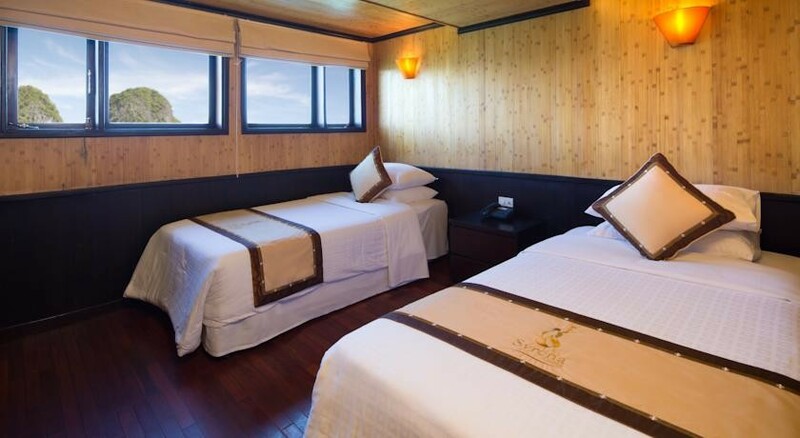 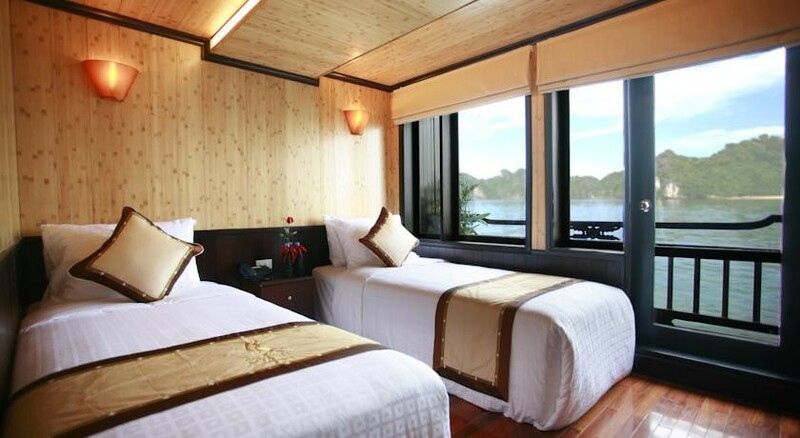 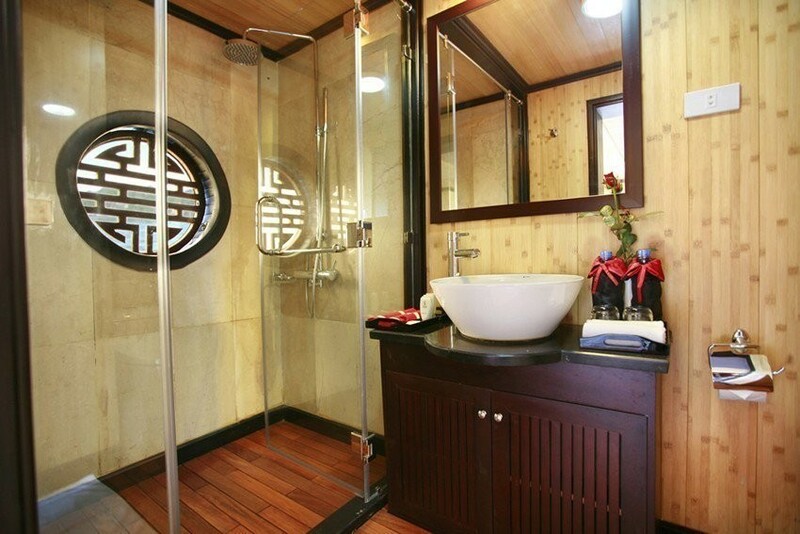 Cabins on the cruises are really charming with nice decoration and equipment, with traditional Vietnamese hardwood creating lavish warmth. 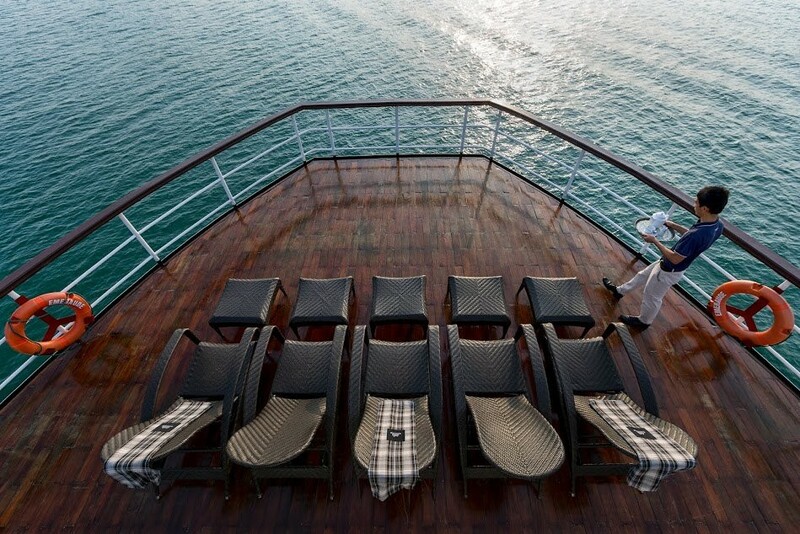 Light materials and clear windows ensure that each cabin on Syrena Cruise is bright and airy. 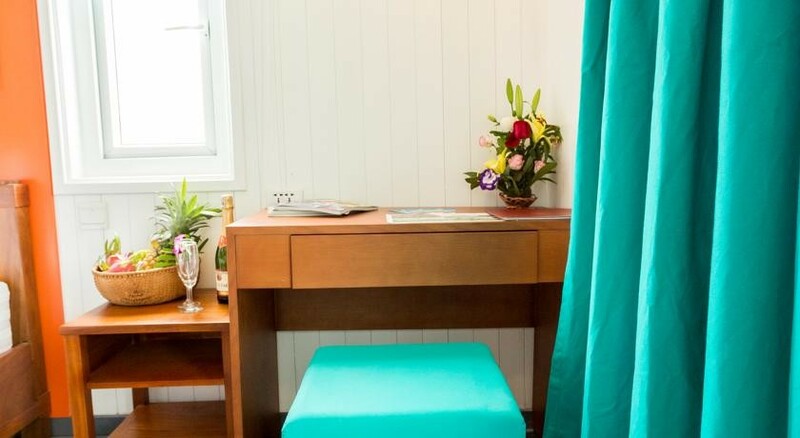 Moreover, hand-crafted furniture and delicate upholstery further enhance the warmth and light in each cabin. 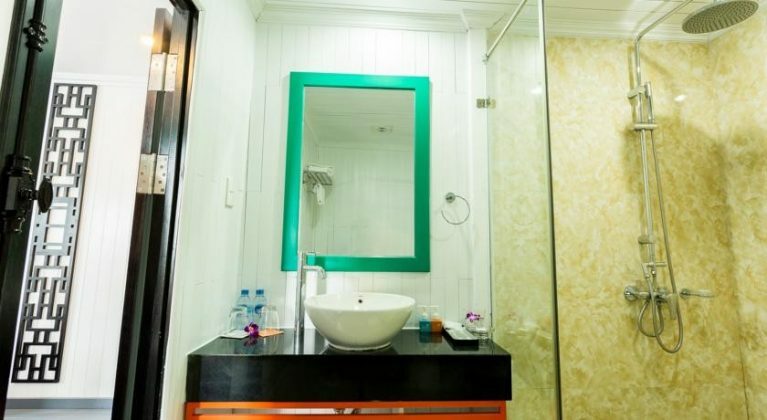 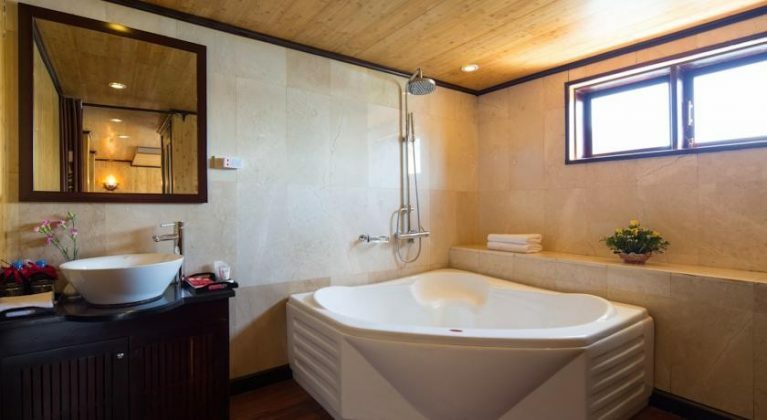 There are 2 types of rooms on offer: Deluxe Cabins and Syrena Suites. 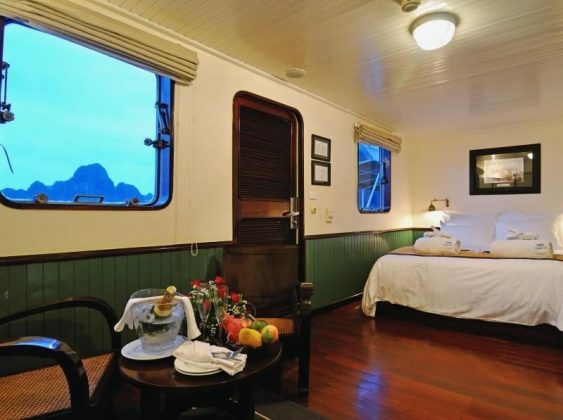 The two spacious Suites (21m²) are in the forward section of the lower accommodation deck. 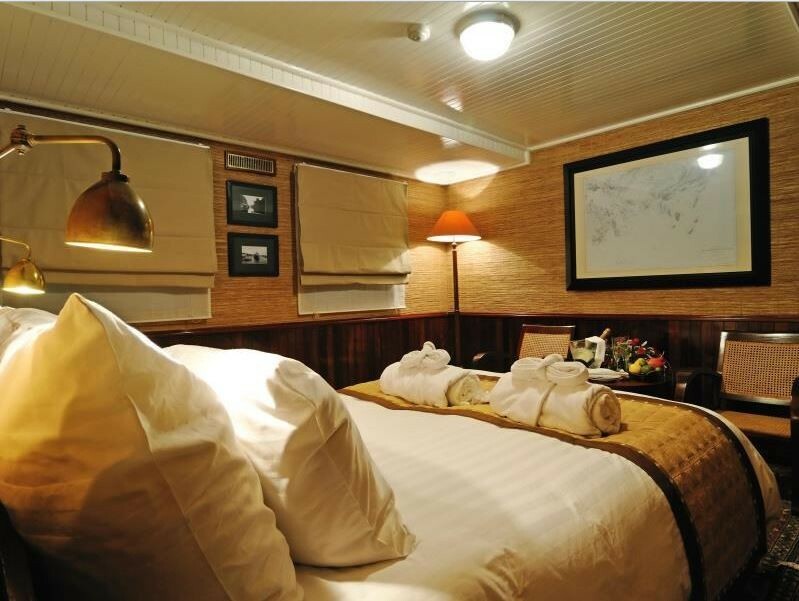 Each Syrena Cruise Suite offers all the standard amenities of the Deluxe Cabins, plus a larger ensuite bathroom with bathtub, picture windows, and a 32” LCD television. 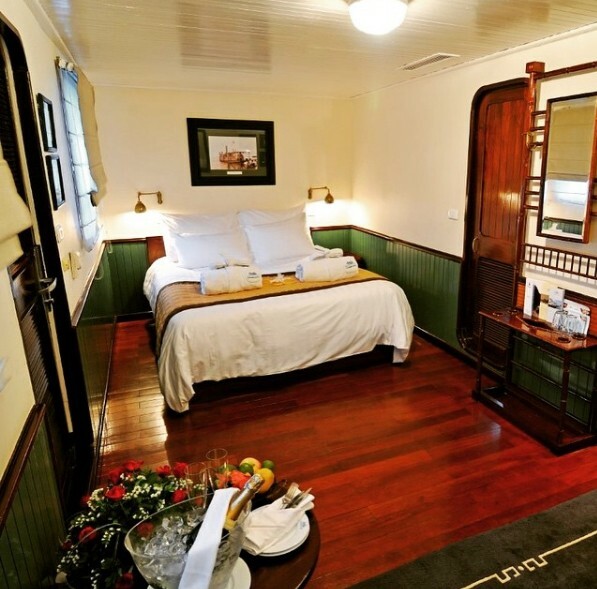 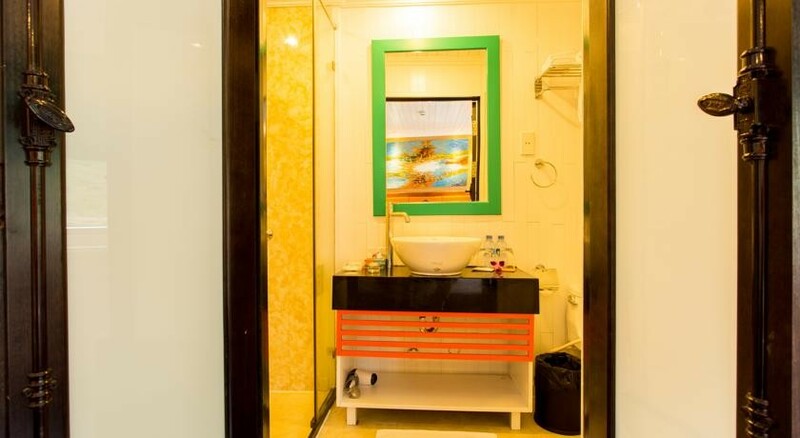 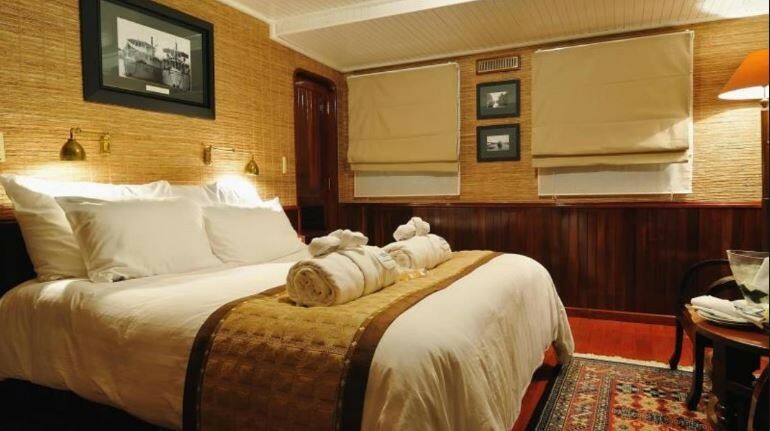 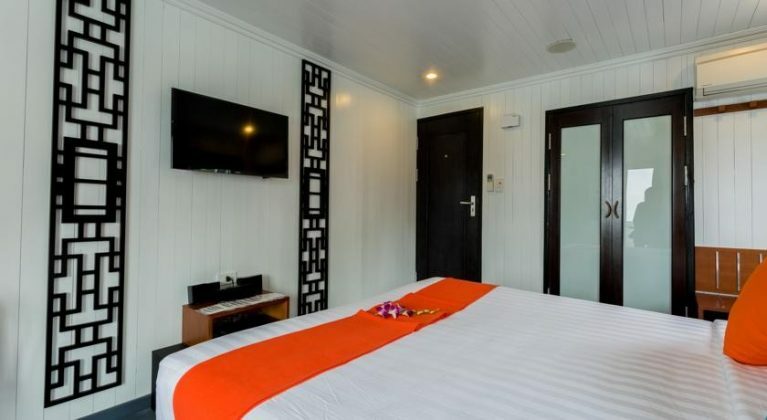 The Deluxe cabin (15m²) also offers all the amenities necessary for you to feel comfortable: twin beds or a queen-size bed, air-conditioner, en-suite bathroom with shower. 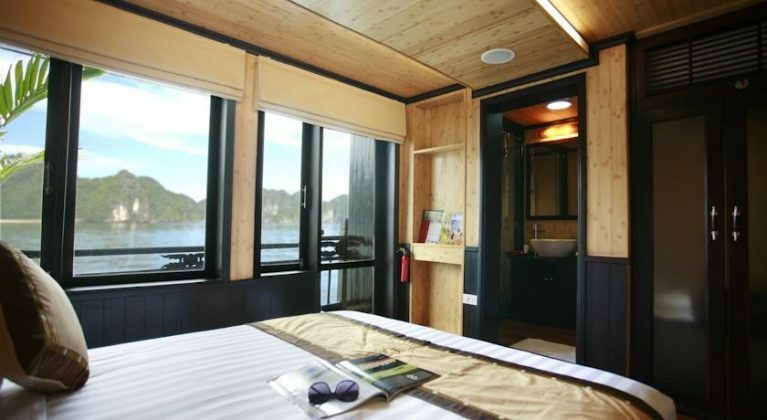 And each Deluxe Cabin on Syrena Cruise features a picture window, providing added light and memorable views. 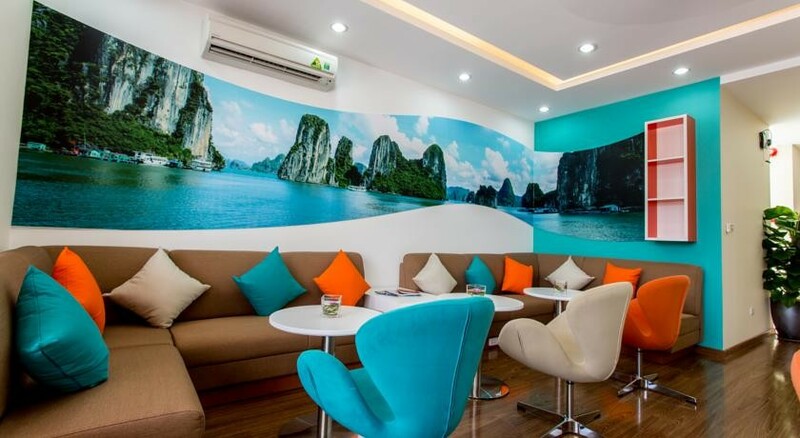 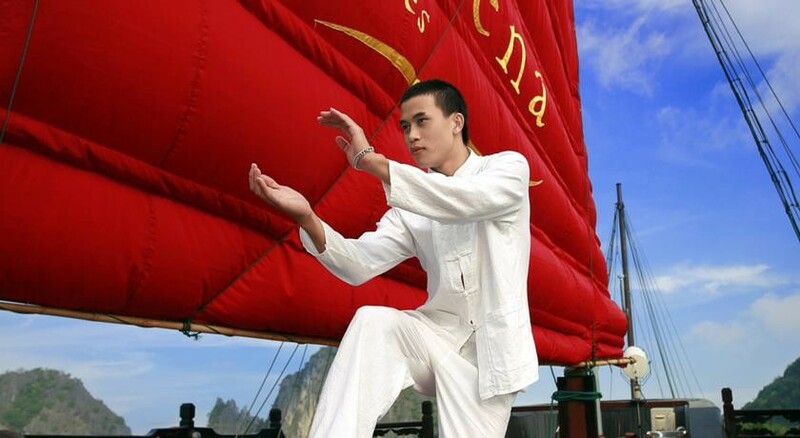 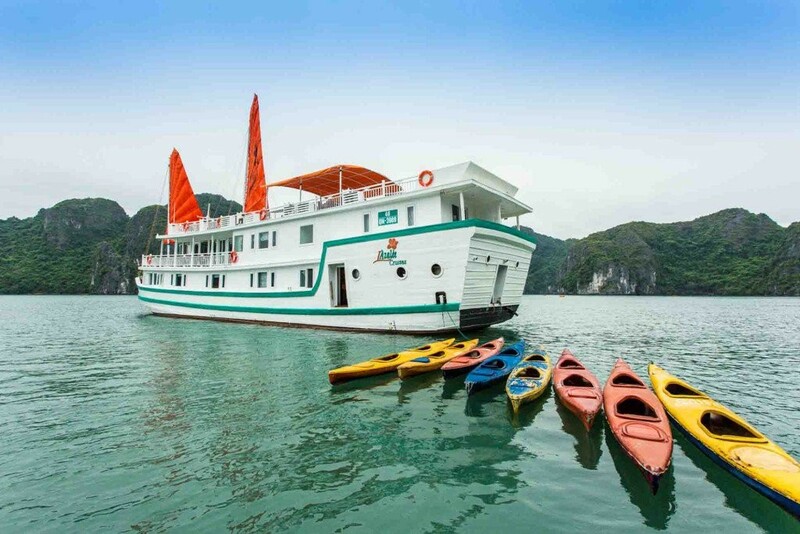 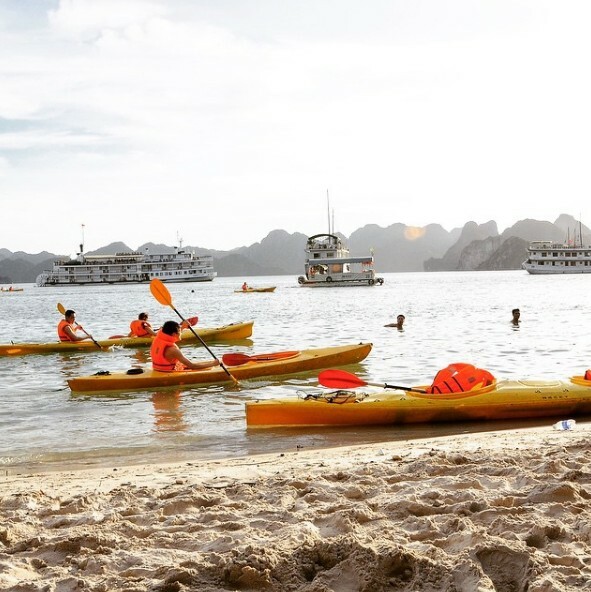 More fascinatingly, swimming, snorkeling, and kayaking in the crystal waters of Ha Long Bay are favorite activities for the energetic while morning Tai Chi on the sundeck offers a meditative and uplifting start of the day. 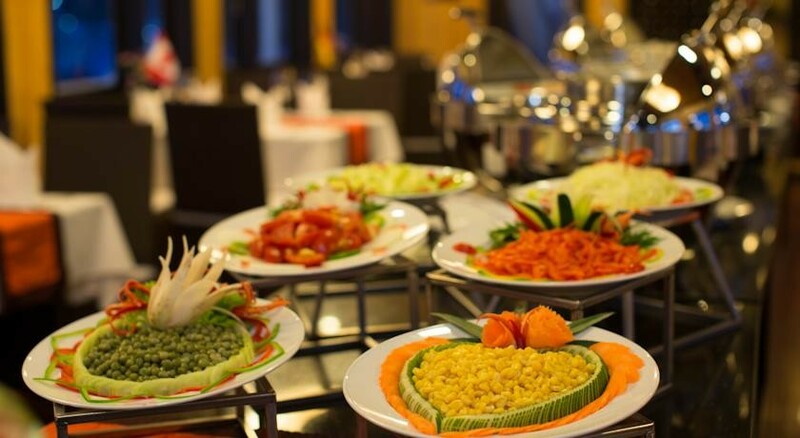 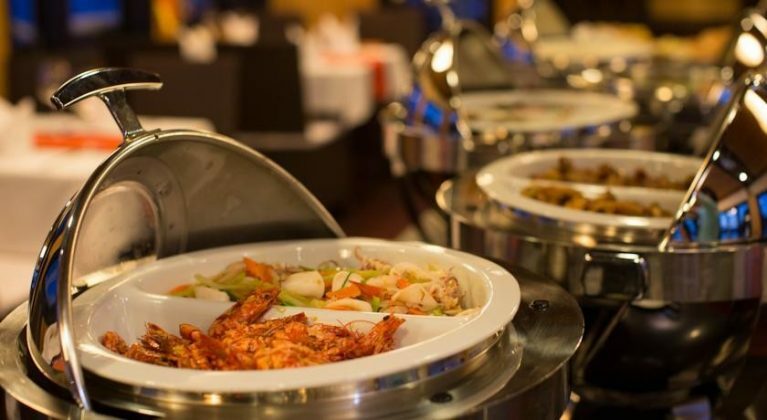 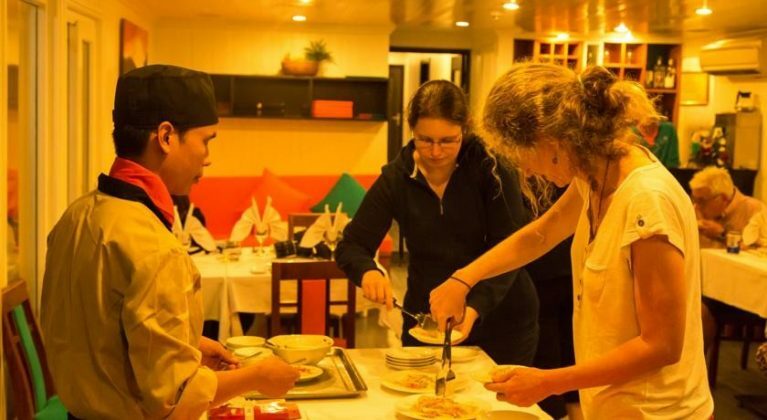 Adventure outings, tour excursions, and cooking classes are also available on board for your best cruising experience ever. Read more Halong Bay travel guide at here.